Milano Volunteer Ministers demonstrate assist techniques to 200 Italian civil protection workers. Members of the Italian Army, among others, learn the magic of assists from VMs. Churches of Scientology around the world have Volunteer Minister teams which set up tents in local parks and city centers, provide emergency assistance and disaster relief and otherwise help their communities. One perfect example is the Milano Volunteer Minister team. 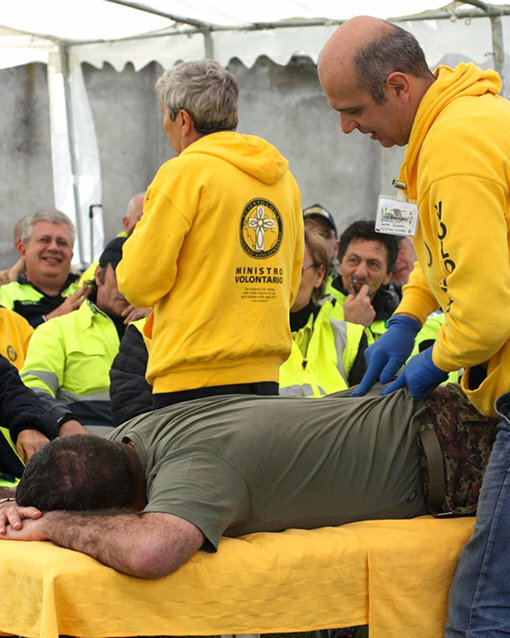 They recently participated in a weekend of training with 30 Italian civil protection groups in the city’s sprawling “North Park,” where they delivered a workshop to an audience of approximately 200 on assists for illnesses and injuries. Having witnessed this, a number of attendees made a beeline for the VM tent after the workshop to get their questions answered and receive free booklets on assist techniques. During later drilling, VMs demonstrated other techniques with their fellow training participants who all attested to the effectiveness of these simple tools to better everyone. VMs the world over get the satisfaction of knowing they can bring effective tools to bear whenever needed. Here is what four VMs have to say. Write in and tell us what it means to you. I had a friend who had a terrible headache for weeks. She went to doctors whose only solution was drugs, which she didn’t want to take. I took her outside and gave her a locational assist. After about 20 minutes, she got a stunned look on her face and told me the headache actually felt better for the first time in weeks. She was shocked and has never forgotten it. I love that feeling—to be able to provide solutions right there, right then, in that moment.—D.B. One day on a bus, I met a lady who was very upset. She was let go after years at her job just days before Christmas and was heartbroken that there would be no Christmas for her kids. Applying tools from the VM Cause of Suppression Course, I helped her identify who in her life was negative and had been turning things upside down. She realized it was her boss! By the time we got to her bus stop, she had stopped crying, she was all beams, and she said that she knew she would make a happy Christmas for her kids. That is how, by being a Volunteer Minister, I am helping to make this a better world.—B.B. For me, by being a Volunteer Minister I am able, even in the worst of conditions, to assist, organize and offer help. Most people have no idea what to do. We know something can be done about it.—A.L. As a Volunteer Minister, I get the immeasurable joy of helping people gain control of their lives. There’s nothing like it.—M.B.